The work also yielded a surprise: the materials showed a peak efficiency - the rate at which the material converted light to electricity - before the intermediate phase transformation was complete, suggesting a new way to produce the films to ensure maximum efficiency. 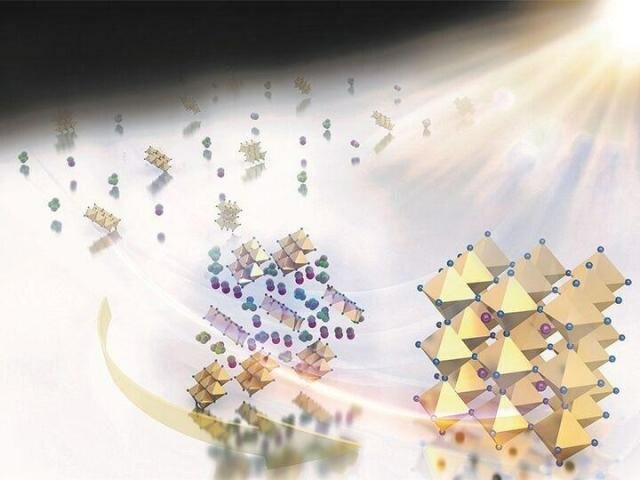 Yao said researchers would have expected the highest efficiency to come after the material had been converted to 100 percent perovskite film. Instead, they discovered the best-performing solar devices were those for which conversion was stopped at 18 percent of the intermediate phase, before full conversion. "We found that the phase composition and morphology of solvent engineered perovskite films are strongly dependent on the processing conditions and can significantly influence photovoltaic performance," the researchers wrote. "The strong dependence on processing conditions is attributed to the molecular exchange kinetics between organic halide molecules and DMSO (dimethyl sulfoxide) coordinated in the intermediate phase." Perovskite compounds commonly are comprised of a hybrid organic-inorganic lead or tin halide-based material and have been pursued as potential materials for solar cells for several years. Yao said their advantages include the fact that the materials can work as very thin films - about 300 nanometers, compared with between 200 and 300 micrometers for silicon wafers, the most commonly used material for solar cells. Perovskite solar cells also can be produced by solution processing at temperatures below 150 degrees Centigrade (about 300 degrees Fahrenheit) making them relatively inexpensive to produce.